Stories that Make You Say "Only at SAR!" 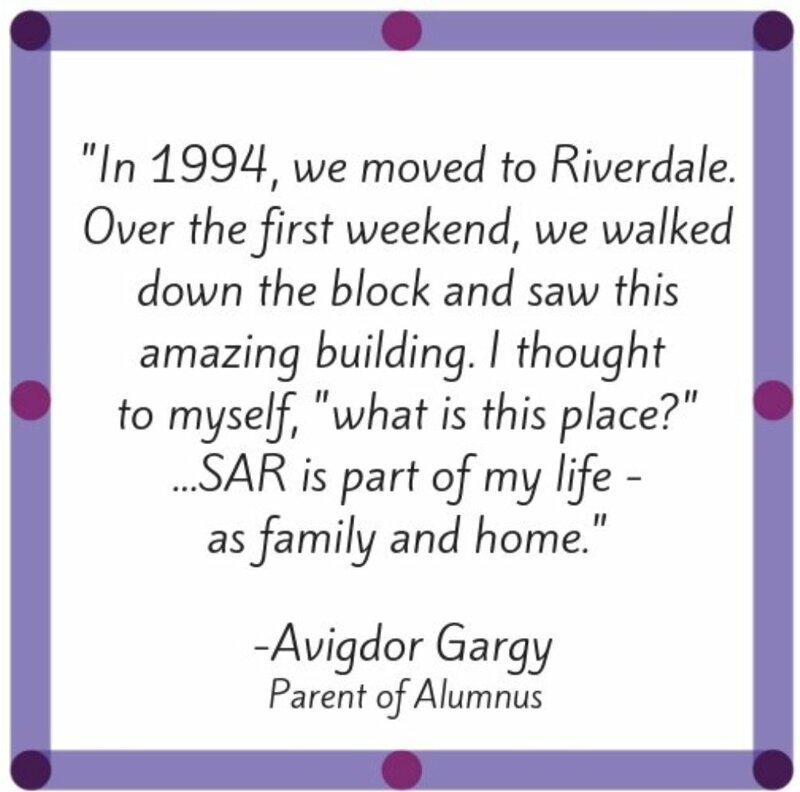 We are excited to share with you the second edition in our series of 50 Spectacular Stories in honor of SAR's milestone anniversary. Our 50-year history is made up of millions of moments, big and small, that span from personal to communal, and everything in between. We are collecting stories from the members of our Academy and High School community and invite YOU to participate in this spectacular initiative. Hearing the word "Founder" often evokes the image of long ago funders, captains of industry, supporters who would often leave the foundation work to others. At SAR, this could not be further from the model of our Founders. For this very special group of people, creating this school was a labor of love, of heart and soul, with the shared goal that reflected their own religious, spiritual and intellectual values as a community. Consequently, no task was too small or unimportant to them, especially for Erica & Ludwig Jessselson, and Edmond Lang, zichronam livracha, & Lucy Lang, tehi briyah. Click HERE to hear about the legend of the Fantastic Four. 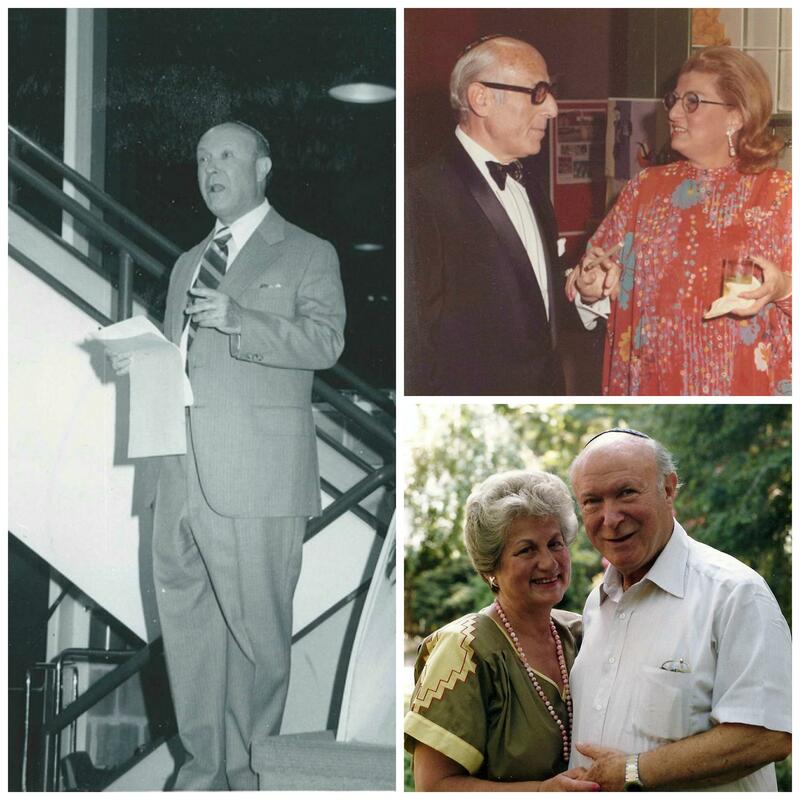 Pioneers of their time, our grandparents Rabbi Jack and Elissa Sable were instrumental in bringing modern Jewish Orthodoxy to Riverdale in the mid-1950s. Our grandfather, together with a group of dedicated parents and supported by the Jesselson and Lang families, started the Riverdale Hebrew Day School, which later merged with the established Salanter and Akiba yeshivot, to become Salanter Akiba Riverdale Academy, or SAR. And, it was a family undertaking as our grandmother was the school's music teacher. Click HERE to read this touching tribute. It was very exciting for me, when in 1971, the students of Salanter, Riverdale and Akiba were united under one roof in the newly renovated Carriage House. The next two years were a period of thrilling emotional, intellectual, spiritual and creative growth. It was "Start-Up Education" in the best possible way, and we had a sense that anything was possible. Click HERE to read more about the spirit of SAR. One of the most moving and inspiring events that ever took place in our school was the 50th Anniversary commemoration of Kristallnacht. why don't we break glass? no, that is too horrible and traumatic. but we do it at a wedding. yes, but at a wedding you're at a high and it's to bring you down. today, we are way down and we want to come up a bit. so why don't we put glass together? Click HERE to read more about the Shards of Broken Glass. As American citizens, we commemorate events such as Veterans Day and Thanksgiving with programs that express pride and hakarat hatov to our country. In addition, throughout the year, SAR includes U.S. Troops as a priority in its chesed initiatives. 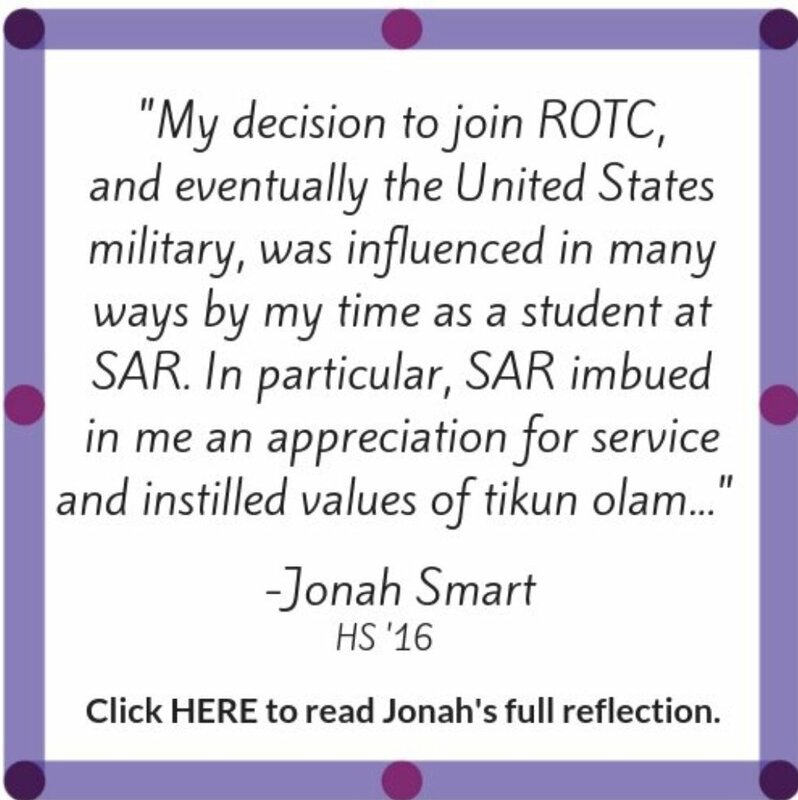 In the Chesed Tent at SAR Academy and in Sophomore year at SAR High School, students pack packages with sweet treats and even sweeter notes of gratitude, along with key staples such as special antimicrobial socks, or holiday items specifically for Jewish troops. 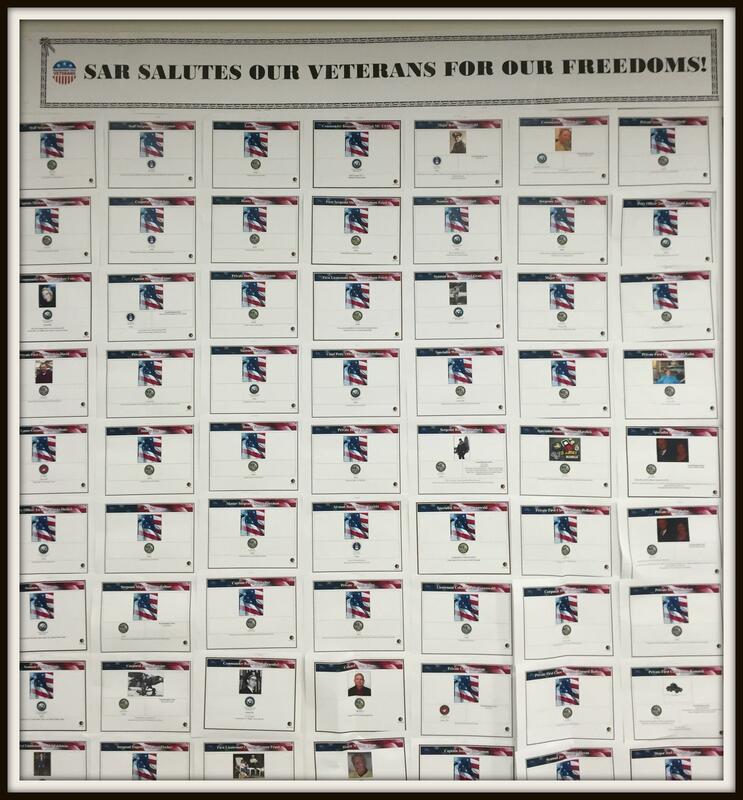 Click HERE to see how our Veterans Day programming came to be. 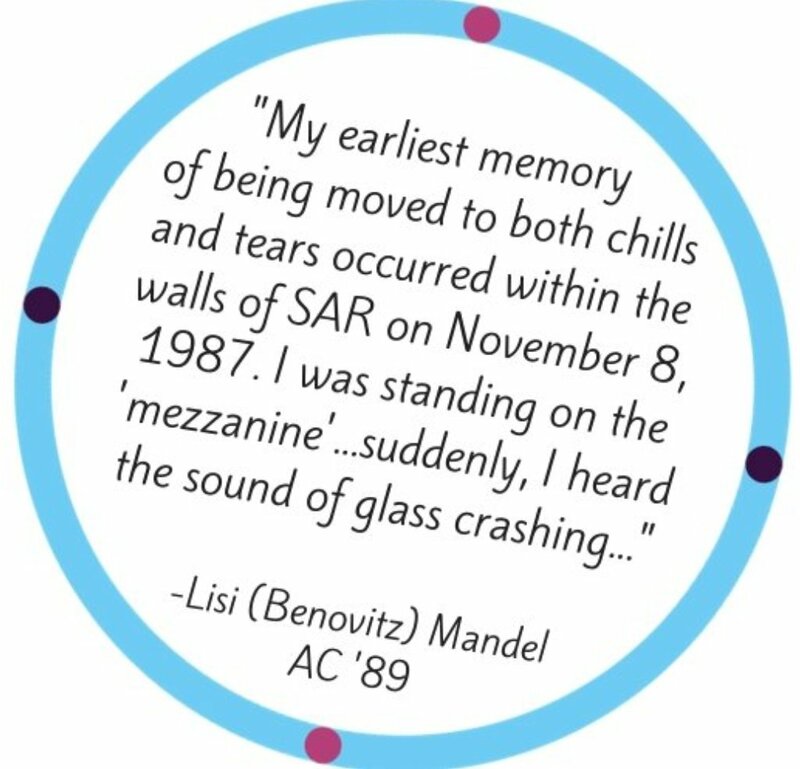 These are the stories and tales from our beloved community members, who through their connection and commitment to SAR left an indelible mark in the lives of so many. current students at SAR Academy. "I began my teaching career at Riverdale Jewish Day School in 1968, and was part of the faculty the following year when we merged with two other schools to become SAR..."
Click HERE to read the special reflections from Cooki Levy, Former Faculty and Current SAR Grandparent. 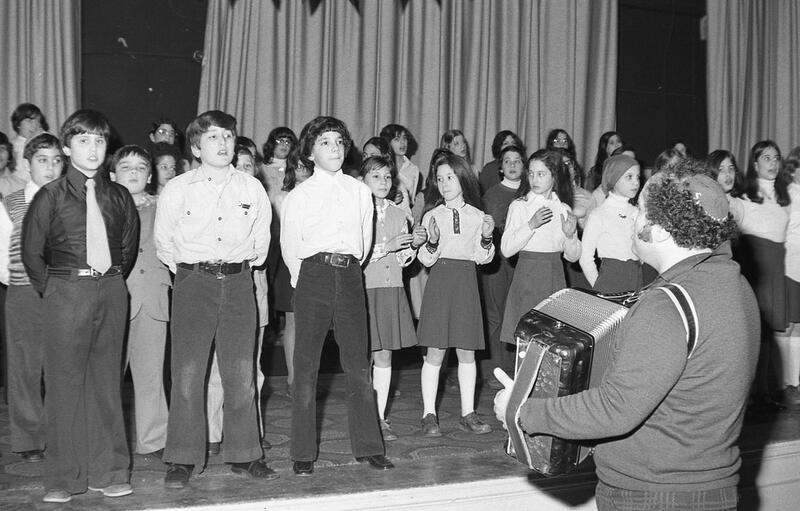 Mr. Avshalom Katz teaching music back in the day! 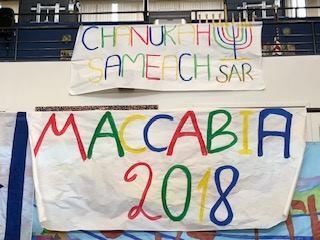 "One of my favorite memories as a student at SAR was when our entire class got to record a music album..."
Celebrations surrounding Chanukah at SAR incorporated our 50th Anniversary theme, especially during color war programming. At the Academy, each Maccabiah team was named for our school's namesakes, Salanter, Akiba, Riverdale, and the Academy. Also, each day during Chanukah candle-lighting on the steps students sang the SAR@50 song written by our very own Lisi (Benovitz) Mandel AC '89. Click HERE to watch a video of SAR Academy students singing our anniversary song and to sing along, click HERE for the lyrics. The tune should be familiar to you! 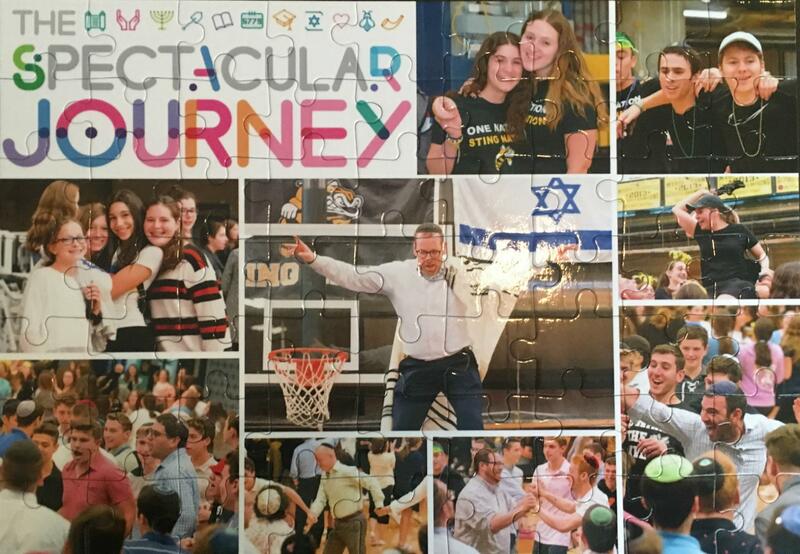 At the High School, Mac-A-Bee included an SAR@50 Trivia game and infused other opportunities to celebrate our jubilee, including putting together this puzzle (pictured above!) during the color war Amazing Race competition. Click HERE to watch the epic launch of Mac-A-Bee featuring Rabbi Tully Harcsztark and his alter ego M.C. Harc! The students had a blast celebrating the holiday! Share your SAR STORY and personal reflections by clicking HERE. We're looking for memories of SAR alumni playing outside the Alef, participating in Chanukah candle lighting at the Academy, MAC-A-BEE, and other stand-out moments of your days at SAR Academy and High School.